Adventure Inn is 100% solar-powered with a 72.8 kW system that produces 104,120 kWh of power annually. The clean energy powers the hotel’s rooms and electric vehicle charging stations installed by the city. The system will reduce 135,981 pounds of GHG emissions each year – the equivalent of planting 1,735 trees. In addition to the environmental benefits, the system has the potential to save the hotel more than $270,000. The Moab Arts and Recreation Center demonstrated its stewardship in conjunction with Terrasophia by installing a rain capture system that is used to water the new drought-tolerant native species planted during a recent remodel. The Art Center hosts several sustainability events such as a clothes swaps and the T-shirt bag workshop. Not only has Tim Buckingham, hosted sustainability events such Mindful Movies and a C-PACE Lunch & Learn, the Atomic offers shuttle services to visitors to reduce the traffic downtown. The Atomic works with local GtG hotels. KZMU hosted an amazing up-cycle workshop with some experts from Santa Fe. Plastic bottles were compacted into construction bricks and made into a bench! KZMU is also experimenting with biocrust revegetation. Biological soil crust, also known as cryptobiotic soil, is the foundation of desert plant life. This black, knobby crust is made up of many different living organisms and plays a vital role in maintaining the desert ecosystem. KZMU is 100% solar and people powered by volunteers. 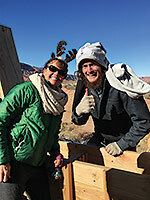 Moab Express is a new shuttle service to reduce local traffic and help reduce air pollution. Moab Express is the first shuttle service to join Green to Gold and has made an effort to encourage visitors to make Moab a car-less vacation whenever possible. The cottages have been sustainably built with reclaimed timbers from the Great Salt Lake and structural insulated panels (SIPs). SIPS are a high-performance building system for residential and light commercial construction. The panels consist of an insulating foam core sandwiched between two structural facings, typically, oriented strand board (OSB). SIPs are extremely strong, energy efficient and cost-effective. 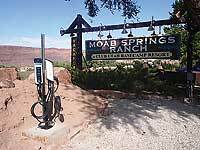 Additionally, the Moab Springs Ranch has made an effort to post water conservation tips with door hangers provided by the City and plans to launch a recycling outreach campaign. As the City is new recycling and trash provider, Monument has embarked on several community initiatives including assisting after the wildfire last year and helping to clean up the Community Recycling Center, Monument has committed to help educate businesses, residents and homeowners about the expanded recycling services that include glass, paper, junk mail, coffee cups, block Styrofoam, and milk containers. Poison Spider has promoted being a bike-friendly community by donating bike racks throughout town to hotels and restaurants that request racks. The facility has skylights/solartubes to use daylight whenever possible. They pay a livable wage and provide employee housing. Portal Vista collaborated with the City in its efforts to publish the City’s first Community Energy Plan. Maggie Corson led the efforts, focusing on reducing both energy and water use among HOA members. Maggie distributed the adult and kid versions of a Water Challenge and distributed rebate information for reducing energy use and saving money. Red Moon Lodge took recycling to the next level by investing in one-gallon metal containers to lend to their guests for day trips, eliminating the need for single plastic water bottles. Red Moon also installed a pollinator garden to attract butterflies. Pollinators are responsible for increasing our food supply and food for wildlife. Howard Trenholme, CEO of Red Rock Bakery, was an early participant in the Green to Gold Program. He installed solar panels last spring. Trenholme is committed to helping other businesses as well as educating his staff and customers about the benefits of solar energy. Red Rock Bakery, along with Navtec Expeditions and the Hyatt place, were the first businesses to convert outdoor lighting to be dark sky compliant. Dark Sky compliant lights use an amber colored light that does not affect our circadian cycles, this helps promote healthy sleep patterns. This City facility has a total hydraulic capacity of 1.75 million gallons per day and can process significantly more effluent using far less water. Water use from the new plant decreased from 2 million gallons to 25,000 gallons per month resulting in financial savings and conserving a valuable resource. All equipment in the plant is equipped with variable frequency, which drives efficiency and leads to power conservation. Please support the businesses making a difference. Any business or non-profit interested in joining Green to Gold or needing educational material such as the NEW Recycling Guides, please contact Rosemarie Russo, Sustainability Director, and City of Moab. Partners receive free audits, conservation tips and more. The City plans to infuse art into some of the sustainability projects such as using solar for the Art Walks. Other cities such as Santa Fe used a dragon sculpture at their dog park to collect dog waste and flare the methane emissions so it looked like the dragon was breathing fire. In Florida, a giant chicken coop wire fish sculpture was used as a plastic recycling container to educate about the deadly effects of plastic on marine life. Have an art idea? Please post on sustainablemoab.com. Upcoming sustainability events include tree planting and painting events on Earth Day, April 22 and Arbor Day, April 26.